The ethnic cleansing of the Rohingya, a Muslim minority from the Rakine state in Myanmar, has become a global human crisis. 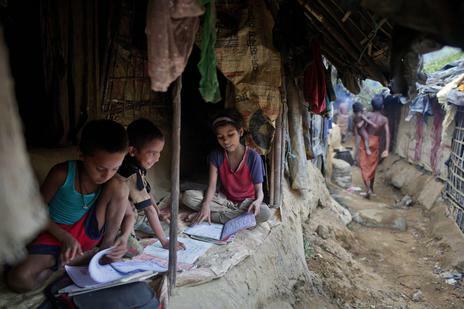 The persecution of the Rohingya is so vicious that they find themselves between the proverbial rock and a hard place. They either had to remain in Myanmar and risk genocide, or be adrift in the Andaman Sea in a desperate attempt to flee. The inevitable choice for thousands was to venture by boat out of violence and annihilation, only to become victims of unscrupulous human traffickers, and be stranded indefinitely at sea without any food and water. A recent report by the U.N. refugee agency estimates that 3,000 or more Rohingya could still be stranded in the Andaman Sea. As this sectarian violence reaches the level of a human catastrophe, the world seems to have turned a blind eye to this tragedy. Even Nobel Prize winners Aung San Suu Kyi and the Dalai Lama have remained non-committal and mysteriously evasive on this matter. The United States, as the moral leader of the world, has an incontrovertible responsibility to put its foot down and send a clear message to Myanmar’s quasi-civilian government to stop these crimes against humanity. It is encouraging that the U.S. House of Representatives passed a resolution earlier this month that implored the Myanmar government to end the oppression and ethnic cleansing of the Rohingya people. A bipartisan group of U.S. lawmakers also urged the Obama administration to actively support the search and rescue efforts, and provide humanitarian aid to these victims of institutional discrimination. It is heartening that countries such as Malaysia, Indonesia and the Philippines have decided to provide shelter to some of these victims who were stranded at sea. However, the world must not forget that while some of these people are saved from death in the sea, a significant number of Rohingya still suffer from violence, racism and ethnic cleansing within the borders of Myanmar. We must stand united against this vicious harassment of thousands of Rohingya displaced in the filthy ghettos of Myanmar. The world must show resolve by sending an unequivocal message that the perpetrators of this tragedy shall not be allowed to continue with impunity. Iqbal Hossain, Ph.D., is an adjunct professor at the University of Utah and a national board member of the American Civil Liberties Union.